The Boys is a fun and irreverent take on what happens when superheroes - who are as popular as celebrities, as influential as politicians and as revered as Gods - abuse their superpowers rather than use them for good. It's the powerless against the super powerful as The Boys embark on a heroic quest to expose the truth about The Seven, and Vought - the multi-billion dollar conglomerate that manages these superheroes and covers up all of their dirty secrets. The Boys are Hughie (Jack Quaid, "The Hunger Games"), Billy Butcher (Karl Urban, "Star Trek"), Mother's Milk (Laz Alonso, "Detroit"), Frenchie (Tomer Capon, "Hostages"), and The Female (Karen Fukuhara, "Suicide Squad"). Simon Pegg ("Mission: Impossible - Fallout") guest stars as Hughie's father. 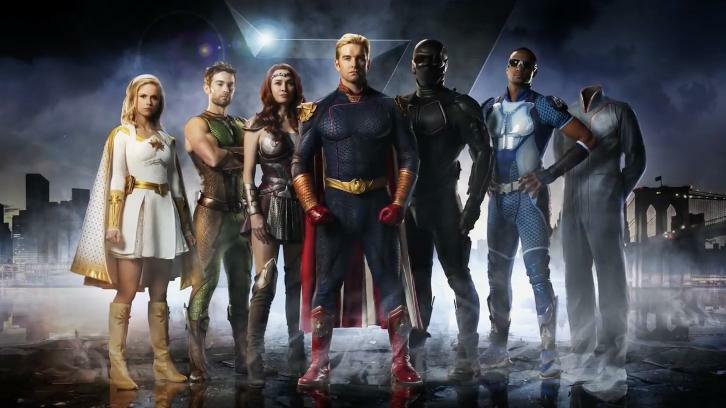 The Supes of The Seven are led by Homelander (Antony Starr, "Banshee") who is joined by Starlight (Erin Moriarty, "Captain Fantastic"), Queen Maeve (Dominique McElligott, "House of Cards"), A-Train (Jessie T. Usher, "Independence Day: Resurgence"), The Deep (Chace Crawford, "Gossip Girl") and Black Noir (Nathan Mitchell, "Supernatural"). Academy Award(R) nominee Elisabeth Shue ("Leaving Las Vegas") stars as Madelyn Stillwell, Vought's Senior VP of Hero Management. Based on The New York Times best-selling comic by Garth Ennis and Darick Robertson, "The Boys" was developed by showrunner Eric Kripke ("Supernatural"), who also serves as writer, executive producer and directed the season finale. Joining Kripke as executive producers are Point Grey Pictures' Seth Rogen ("Preacher"), Evan Goldberg ("Preacher"), and James Weaver ("Preacher"), Original Film's Neal H. Moritz ("Prison Break"), Pavun Shetty ("New Girl") and Ori Marmur ("Preacher"), as well as Ken Levin and Jason Netter. Ennis and Robertson also co-executive produce. The pilot episode was directed by Dan Trachtenberg ("10 Cloverfield Lane"). The eight-episode Amazon Prime Video original series is co-produced by Amazon Studios and Sony Pictures Television Studios with Point Grey Pictures, Kripke Enterprises and Original Film. NEW YORK, OCTOBER 5, 2018 - Amazon Studios' highly-anticipated eight-episode series The Boys took the stage at New York Comic Con with a panel discussion with the cast and creators - and a first look at the subversive superhero series. In addition, fans were treated to a surprise cameo from Simon Pegg, whose likeness was the inspiration for "Hughie" in the original comic book series. It was revealed, with a quintessential awkward family photo, that Pegg will be appearing in the series as Hughie's (Jack Quaid) dad. Pegg's role will be a guest starring one. The Boys is a fun and irreverent take on what happens when superheroes - who are as popular as celebrities, as influential as politicians and as revered as Gods - abuse their superpowers rather than use them for good. It's the powerless against the super powerful as The Boys embark on a heroic quest to expose the truth about "The Seven," and Vought - the multibillion dollar conglomerate that manages these superheroes. Simon Pegg will play Hughie's father Dougie (a Scottish name in honor of Hughie's Scottish background in the comics). "He's just one in a line of men who haven't really fronted up to life and has spent most of his time eating pizza rolls and watching Remington Steele…," Pegg explains. "Hughie really is the one that breaks that cycle of inactivity and torpor, so in a way, Hugh's father is a specter of his own kind of inaction and he has to take a stand." The superhero adaptation stars Tomer Kapon, Elisabeth Shue, Karl Urban, Jack Quaid, Laz Alonso, Erin Moriarty, Karen Fukuhara, Antony Starr, Chace Crawford, Dominique McElligott, Jessie Usher, Nathan Mitchell and Jennifer Esposito.